UPDATE: August 24, 2016 As of today the website has been taken down. Edward Glenwright appears to be shy about his new business venture. Although his contact details initially showed up in his whois information, this was soon replaced with a “privacy service“, thus making it difficult for customers to identify him. This would not normally be a problem, but the web site initially had no contact details and no details of the Company behind the venture – assuming there is one. This has now changed and it appears that the man behind the business is Ian MacDonald, who operates from a maildrop in Edinburgh. This may be simply an alias for Ed Glenwright. The only Ian MacDonald that appears in a Google search is the Membership Secretary of the Glasgow Grouse Club. The web site is very basic, being created using tools available on Web.Com. This is a home made site with little useful content. The absence of details of the vendor is worrying and probably illegal. There is no information about privacy, no evidence of registration with the Data Protection Act (The Data Protection Act 1998 requires every data controller (eg organisation, sole trader) who is processing personal information to register with the ICO), no mention of how cookies are used on the site, no terms and conditions. You get the gist! Checkout is only possible using PayPal. Whilst PayPal is a popular option, very few reputable sites offer only PayPal, as so many customers prefer NOT to use this method. The most likely reason is that the trader has been unable to obtain a regular merchant account from their bank. It is our normal practice to make a test purchase in order to evaluate the product but we were wary about the poor quality of the site and the fact that land plots are offered for sale in three locations (Loch Lomond, Loch Ness and the isle of Skye). Frankly we doubted that Mr Glenwright has any land to sell, particularly as the site gives no clues, so we emailed him for details of the land before buying. We had no reply and conclude that the whole enterprise could be a scam. We advise buyers to think carefully before parting with their money. If you do make a purchase, please let us know how you fared. We are particularly curious to know what Company is behind this venture, whether they own any land, whether they plant any trees and whether Mr Glenwright is a crook. Like other souvenir land businesses, My Highland Titles have taken the time to create a social media presence on Facebook. As of July 2016, this site has less than 20 likes and little content, but it is early days. They have certainly made a very generous offer to grow their page, although cynical readers may doubt that this is a genuine competition. So it is early days for this new entrant to the business. Claims of extensive landholdings, large numbers of trees to be planted and big giveaways on Facebook could be the start of something good, or may be simply a criminal attempt to scam money from a gullible public. Four weeks after the first fake “like-farming” competitions started, Facebook banned the MyHighlandTitles page. Can anyone doubt that the website will be far behind? 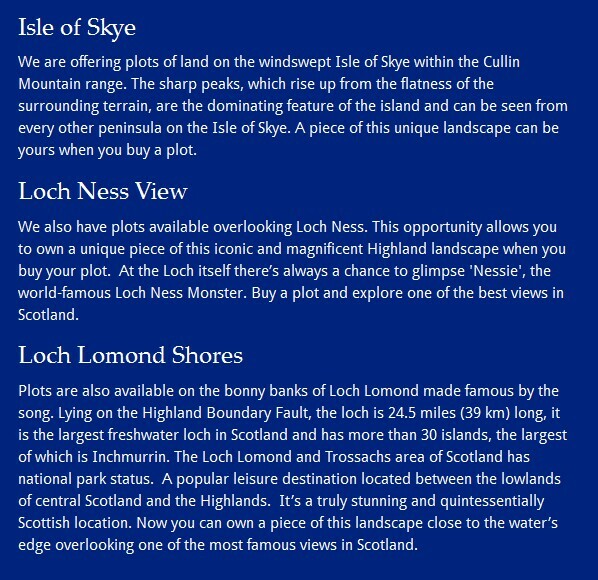 And if you look on My Highland Titles website it shows the name of the owner.